We are driving to the Rhodes Airport in about 45-minutes to fly to Athens. We are spending the night in Athens and I have an early morning Friday flight to London, then Philadelphia and finally Pittsburgh. I get back to Pittsburgh Friday night. We had an extremely productive day of final meetings with the Greek Officials as part of closing our data collection in Rhodes. We met with officials from the Archaeology Commission and gave a presentation outlining our preliminary finds. They were stunned by the amount of work we could accomplish in ten days. 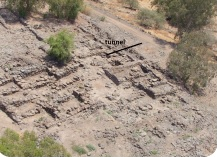 The data from Kahal Shalom revealed two possible buildings beneath the current one. Walls were found at a depth of over one meter, and again at nearly three meters beneath the surface. One question is, are these from the same structure or do they represent two different structures. Excavation will reveal the answer, and the Greek officials are considering an a limited exploratory excavation at this site. This could perhaps occur next January (2016) when we may return to continue our work that we began this year. At Kahal Grande, the data also revealed building sequences beneath the current ruined structure. What is very interesting is that the older structure beneath the current land surface may be the remains of a synagogue, and adjacent to this are the ruins of a christian church. This poses and interesting questions. Did the two exist side by side in antiquity? This would be of great cultural significance if a synagogue and church existed side by side and operated at the same time in antiquity. Further analysis of out current data and new data may reveal these answers. The work at the Grand Master Palace also revealed some interesting data. 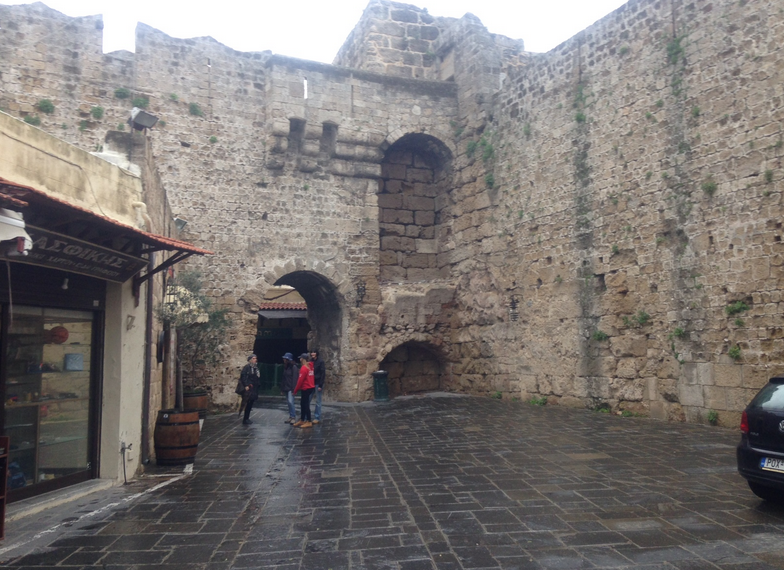 There are definitely Byzantine era walls outside of the defensive wall of the Knight Templar palace, and the palace in places uses these wall as the foundation for its walls. After talking to Greek researchers that have spent years researching these walls and possible associations with the location of the Colossus of Rhodes, these discoveries are very promising. The use of a new technology for the Greek portion of the project, Electro-Resistivity Tomography (ERT) will definitely allow more detailed subsurface mapping. The plan is to incorporate this technology into the proposed research design for January 2016. The data generated from this equipment will help answer some of the questions we have about building sequences for one. Below are walls from the Hellenistic period that predate the Byzantine walls. In many places these walls are actually higher in elevation the the younger Byzantine walls which puts them out of strategraphic sequence. This presents an interesting problem to solve related to the possible location of the Colossus. At the meeting with the Greek officials we received a verbal invitation to continue the work in January 2016. This will become an official invitation once we submit our final reports. Additionally, we have been asked to expand our research design to include additional components. We discussed a DNA study related to the thousands of burials they have excavated and cataloged. No such study has ever been completed in Rhodes and this would add much needed information to the base of knowledge about the lineage of the Rhodians. They will be mailing four teeth to me in the near future for DNA analysis which will serve as the starting point for the project. This project has great potential for student and faculty involvement and funding. I think there are also opportunities to incorporate other disciplines found in the Bayer School into this project. Those ideas are still be thought out. Below is the Pottery Analysis Lab at the Archaeology Commission. As you can see it is located in an ancient castle. The lab lacks the necessary equipment to do advanced chemical analysis, and that is way way that other components in BSNES can become involved. Off to the airport. I will try to blog some more of my thoughts tonight regarding how we can further develop these research designs to include Duquesne students and faculty, and how we can fund these endeavors. The research is winding down for this trip. We are completing our last full day of field research today (Tuesday January 20th). Today we are working at Kahal Grande. 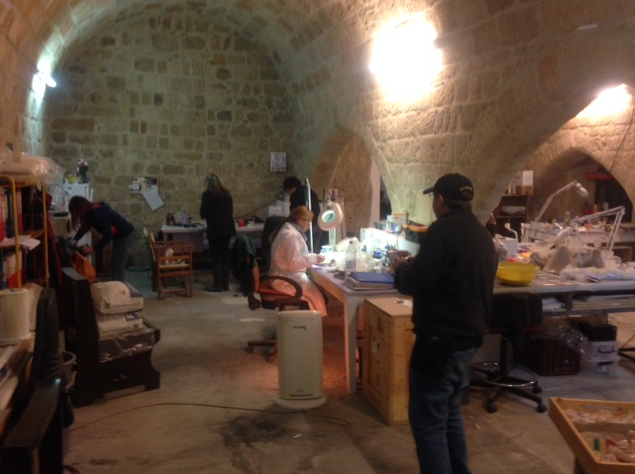 It is the third of the synagogue sites we have worked at in the Old City of Rhodes. We have completed our data collection at Kahal Shalom, and the Church of the Victory, and we will finish today at the Kahal Grande. The research design today is similar to the other synagogue sites. It is hypothesized that there is an older synagogue(s) under the most current construction. The Kahal Grande Synagogue according to records in the Jewish community was constructed in 1480 AD. It was ruined several times and reconstructed, and was last destroyed by Allied bombing raids in World War II. Once again we are using GPR to locate the buried building sequences beneath the current floor of the ruined structure. It is speculated that this floor is from the 19th century synagogue that stood on the site. I will post a preliminary plot of the data when it becomes available in a day or two. I just completed an overland survey using a total station that collected data points (location and elevation) in and around the Kahal Grande, so that our GPR grids can be matched up to existing architectural drawings of the site. We also did an overland survey from the Kahal Grande to the Church of the Victory so that we can link those surveys together. Similar data collection was completed at all the other sites as well. By collecting these data, we can essentially “tap into” the existing maps and drawings of the sites, which save an enormous amount of time. Below is a photo of data collection at the Kahal Grande site. Tomorrow is our end of project meeting with the authorities from the Archaeology Commission. At that meeting we will present the preliminary data we collected, and make short, medium and long term plans for the future of the project. The preliminary data is very promising, and discussions have already begun, even before tomorrow’s meeting, about returning next January to continue the research. Discussions have already begun as well about establishing a field school on Rhodes to continue the project. This year three students associated with the University of Hartford participated in the project, and my hope is that we can get Duquesne students, and perhaps even faculty involved. One major accomplishment of this trip has been that our research team has gained the confidence of the Greek officials. Now that we have achieved that, we can build from there. Field experiences, like this, are invaluable hands-on learning experiences for students. Efforts will continue towards this end. To recap these types of efforts, I made a successful connection with the University of Haifa in Israel on this trip for possible student and faculty opportunities associated with the University’s Marine Institute. I also made good connections in Nazareth Israel for future collaboration, but we of course then run into the possible problems associated with student travel to Israel. I feel that the connections I am making in Greece have great potential for future collaborations that will benefit our students and faculty. The visit to the city of Lindos was very productive. Lindos has several claims to fame. There is the fact that the Apostle Paul visited Lindos in the first century AD, as well as the large Greek Era Acropolis built on a hill overlooking the city. Post Greek era constructions by the Knights Templar and then the Ottomans destroyed most of the structures from earlier times, but extensive archaeological excavation and reconstruction of the Acropolis has been ongoing. Hence, the site presents an interesting mix of structures from various time periods. Pictured below is the view from the town of Lindos, looking up to the Knights Templar Castle. What is visible from below are the outer defense walls of the castle. Upon entering the castle it becomes abundantly evident that there is a mix of time periods. Pictured below is evidence of this. Coming in from the left is a Knights Templar wall. 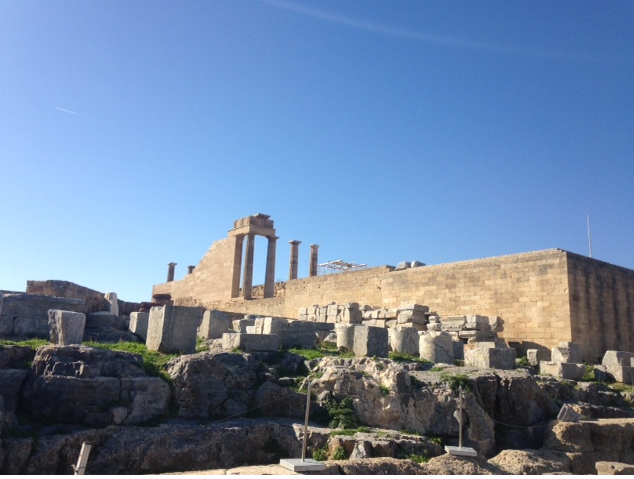 In the center are columns from the Acropolis from the Greek era and in the background are low stone buildings from the Ottoman period. 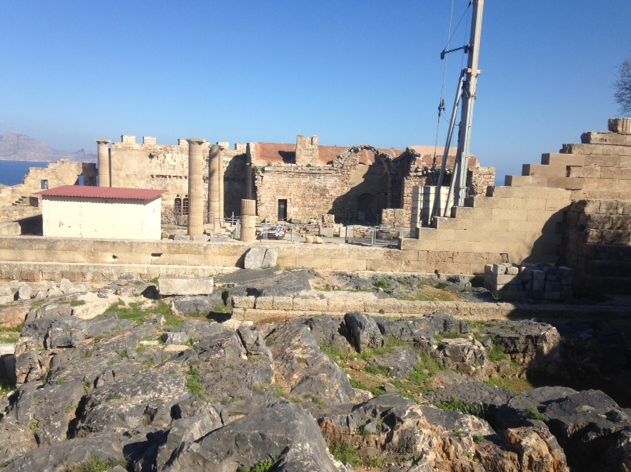 This view and the arrangement of the structures from different time periods provided useful information regarding how to visualize the Grand Master Palace and associated structures from different time periods in Rhodes. 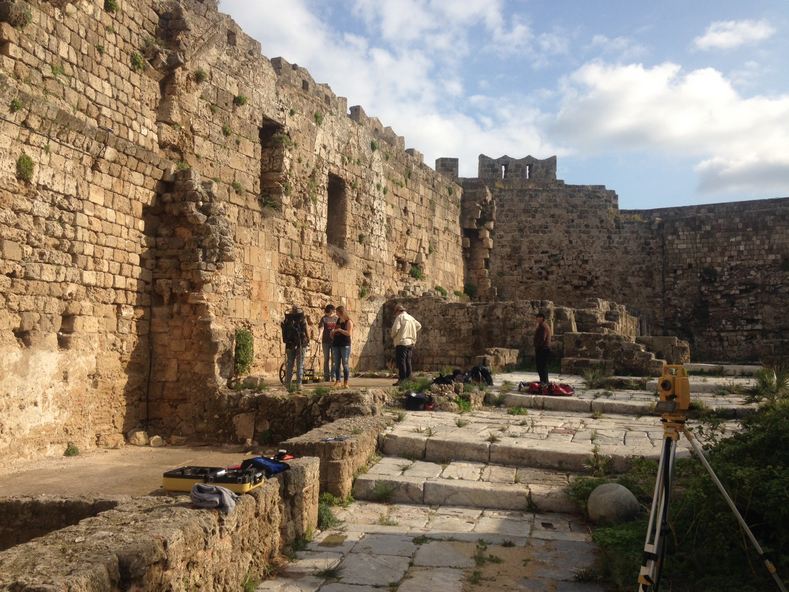 On the following day (Sunday) we were going to complete extensive mapping and GPR data collection at the Ottoman School and Grand Masters Palace, so being able to visualize how the assemblage of structures from different time periods is very important. I will discuss that in detail later. The Greek Era structures at Lindos provide excellent examples of classic Greek Era structures. The Acropolis is still being actively excavated and reconstructed. Pictured below is the temple of Athena. 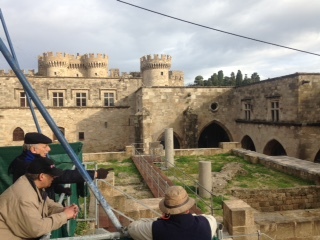 The outer walls are Knights Templar and other time periods are mixed in with the Greek Era structures. On Sunday January 18th we arrived at the Grand Masters Palace at about 8:30 AM. 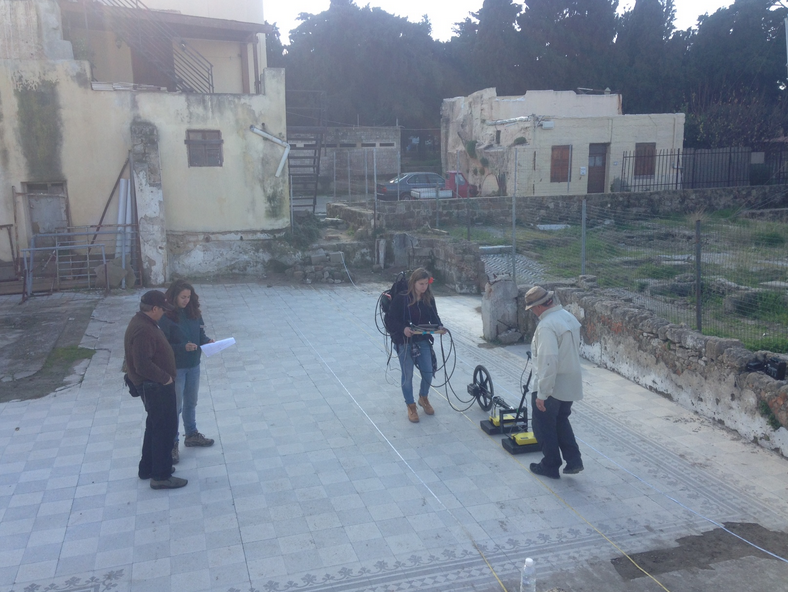 A GPR grid was set up that covered part of the courtyard outside the defense walls of the palace. 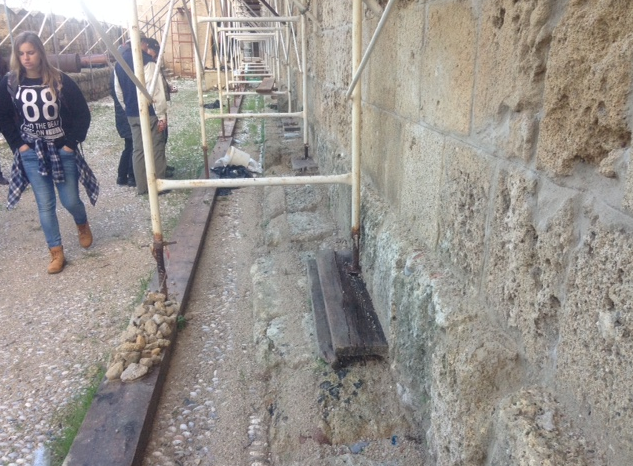 The intent of this grid was to determine if a Byzantine Era wall that can be seen in excavations at the Ottoman School passes under the area, to merge in with the walls of the palace. In the base of the Knights Templar defense walls at the palace, stones from the Byzantine wall can be seen. There are also parallel Byzantine walls outside the Knights Templar walls. Understanding the location of these walls in relation to the Knights Templar structures and structures from earlier eras is important to put the construction sequences in context. A long term objective in the research design is to understand the relationship between the Byzantine era walls, earlier Hellenistic period walls, and the Colossus of Rhodes. The GPR and mapping data we are collection will add significant information to the base of knowledge regarding the Byzantine walls and the Colossus. 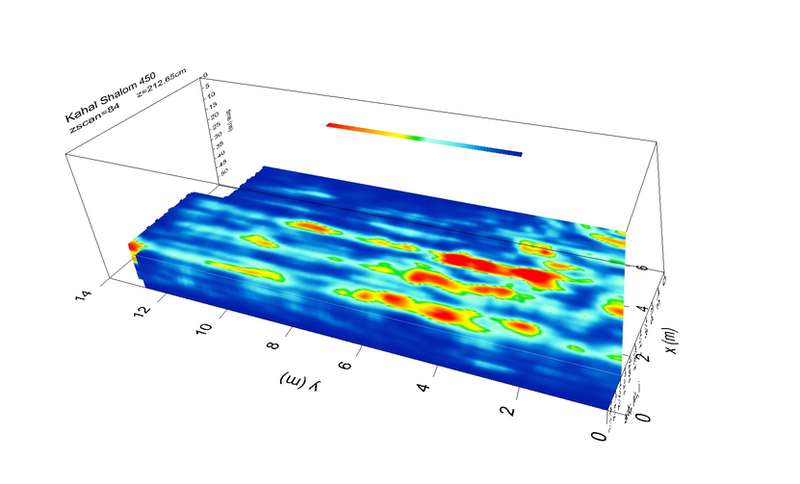 Below is a depiction of the GPR data. This data was collected, sent digitally to GPR Slice, Inc. in California, and this data was then processed and plots were completed. 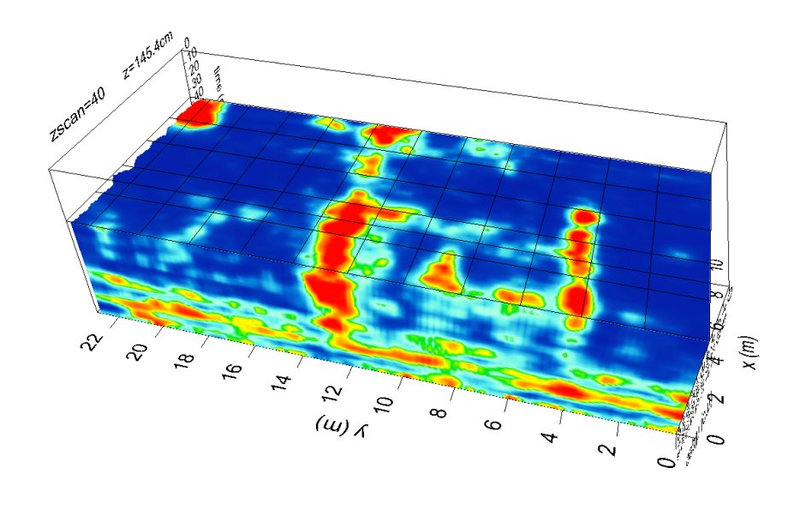 The plot below is a slice from the GPR plot depicting data at 1.45 meters below the surface. The red and yellow areas extending from the bottom of the plot toward the top is interpreted to be a buried section of the Byzantine wall. The less defined area toward the right are areas with other walls that have not yet been defined by age. The Byzantine wall is trending in the correct direction to merge with the walls incorporated into the Templar walls and those that run parallel to these. Additional data will be collected at a later date to better define these relationships and to begin to refine the research design to include a locational study for the base of the Colossus. Lastly, the data from Kahal Shalom Synagogue was further processed, with startling results. The plot is presented below. The parallel red and yellow lines in the plot below are found at 2.12 meters below the current floor of the synagogue. To find these symmetrical features at this depth is very promising in terms of find an older synagogue beneath the reconstructed Kahal Shalom Synagogue. If these walls are indeed the walls of a underlying building, and this building was a synagogue, it may be the remains of the oldest Synagogue yet discovered in Europe. 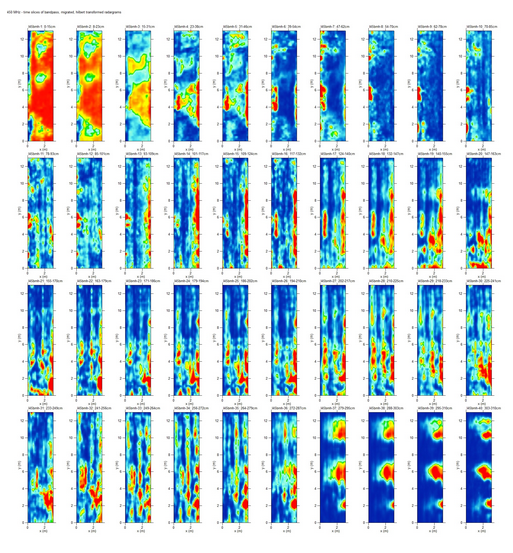 Further processing of the data will reveal even more data about this underlying structure. I am writing this entry for my travel blog from the courtyard of the ruined Church of the Victory. This church and the site where it stood, has a rich history of previous structures, with the Church of the Victory destroyed by bombing in World War II. It is theorized that there is another synagogue under the ruins of the Church of the Victory. The photo below shows the process of collecting GPR data at the site. Once the data is processed, I will blog about the results. Beginning at sunset on Friday January 16th, until sunset on Saturday January 17th is shabbat, the Jewish Holy Day. Since we are a project in part sponsored by the Maurice Greenberg Center for Judaic Studies at the University of Hartford, we are observing Shabbat, by not working today. Today we will tour various sites on the Island of Rhodes, including the quarry where many of the stones were mined to build the Grand Master Palace and other monumental structures on Rhodes. We are also going to visit the Acropolis of Lindos, from the early Greek period, built in the 4th BC and rebuilt many times by the Byzantines, Knight Templar, and Ottomans to name a few. One claim to fame for Lindos in that the Apostle Paul wrote of arriving there in the first century AD. 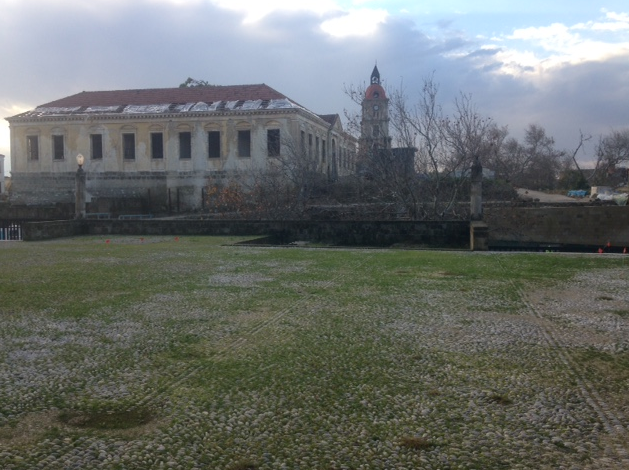 Our work day on Friday January 16th was dominated by planning for the GPR assessment at the Ottoman School, as well as the grounds of the Grand Masters Palace. Most of the day was spent in the Grand Masters Palace exploring it depths and tracing the locations where the Byzantine wall can be seen. It can be seen at two locations at the Ottoman School and it can again be seen in the foundation stones of the Grand Masters Palace. In fact it can be seen in many locations at the base of the palace including the base of what was once a tower. We were taken to the depths of the palace by our co-investigators from the Archaeology commission to see part of the Byzantine wall incorporated into the below ground foundation of the palace. It is a very common practice to use parts from previous building to construct overlying buildings. The Knights Templar did just this when they built the Grand Masters Palace. This is where things get interesting with respect to the Byzantine wall. Were parts of this wall from a previous, earlier construction? It is particularly intriguing because there is a theory that the Colossus of Rhodes, a 30 meter tall statue constructed over a 12-year period and erected in 280 BC, stood on the site now occupied by the Grand Masters Palace. Here is some more information about the colossus. On Sunday January 18 we will begin mapping and GPR work related to the Byzantine wall at the Ottoman School and on the grounds of and within the Grand Masters Palace. Below is the main entry point into the Grand Master palace. Looking from the Grand Masters Palace across a broad open area, one can see the Ottoman School. We are planning two GPR lines on the grounds of the school to determine if the Byzantine wall can be below the current surface materials. Extensive GPR will also be completed on the open space between the Ottoman School and the palace to determine the exact course of the wall. 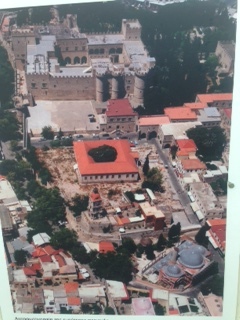 The photo show the Ottoman School from the Grand Masters Palace. Extensive mapping will also be completed to trace the elevation changes of the exposed portions of the Byzantine wall. This will allow an elevation model to be created for the exposed course of the wall and this data can be matched to the GPR data to ground truth the GPR plots in terms of depth. It will also allow a model to be created that depicts the hypothesized course of unexposed portions of the wall. This will include portions of the wall that are now part of the foundation for the Grand Masters Palace. Additionally, this data can be used to create a preliminary model related to the hypothesis that the Colossus of Rhodes was on the current site of the Grand Masters Palace. This of course will require much more research, but this preliminary data can serve as the beginnings of developing a research design for this project. Below is a photo of the Byzantine wall as part of the Grand Masters Palace. The Byzantine portion of the wall are the slightly darker, larger building stones next to where the scaffolding begins. Today we planned to work at a site called the Ottoman School. It is named after the fact that a school was established on the site in the 19th century, part of the Ottoman Period. Like many historic places the school is built upon the remains of older buildings. 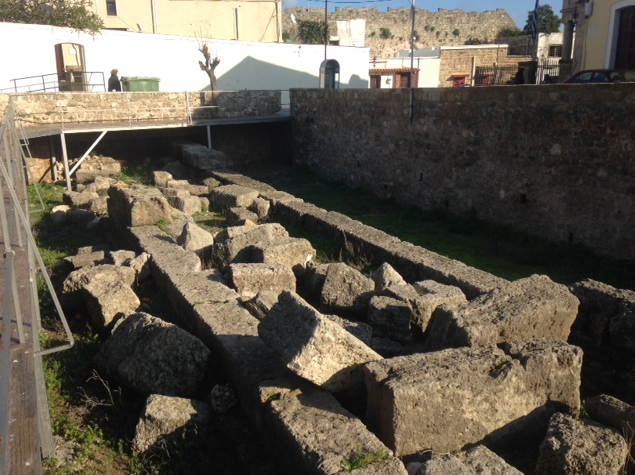 Previous excavations around the school showed indications of Byzantine era (4th to the 7th century AD) walls. These walls are seen in several test pits around the school and extending to the north to what is called the Grand Masters Palace. This is the palace built by the Knights Templar when they took over the region. Traces of the Byzantine walls can be seen in the foundations of the palace as well. 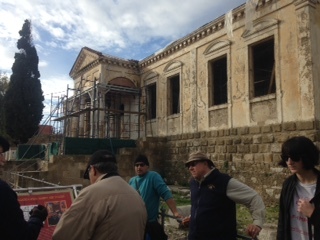 As part of the restoration that is going on at the Ottoman School, the Greek government has asked our research team to see if we can determine, using Ground Penetrating Radar, where the Byzantine walls pass under the grounds of the school, the palace grounds outside the walls, and under the palace. This is an enormous undertaking that would take weeks to complete. Our plan is to find a segment of the wall near the school and near the palace to determine if the equipment can indeed find these features, some of which are buried five or more meters below the contemporary surface. If we are successful at finding these sites, future plans will be made to return to complete a thorough assessment of the area. The Greek authorities desire to tell the most complete story possible for this area, and hence they want to include information about the Byzantine period as well. Below is an aerial view of the school (red roof building with a hole in the roof) and the Grand Masters Palace. Also below is the Ottoman School. As evidenced by the scaffolding, it is undergoing reconstruction as a historical monument. The picture on the right is the view of the Grand Masters Palace from the Ottoman School. Because of the rain we are back at the Kahal Shalom Synagogue completing the GPR survey. To refresh your memory we are completing a survey inside the reconstructed (2004) synagogue, looking for the remnants of an ancient (before 1577) synagogue under the contemporary one. We are collecting the data and it is being sent to a company in California (GPR Slice, Inc.) who are processing the data and providing some interpretation. This is a first for our group, because research team member Dr. Harry Jol (University of Wisconsin-Eau Claire) usually processes and interprets the data on site, but GPR Slice is so interested in the project they have donated their services. Below what are called time slices based on the GPR data. From these subsurface structure can be interpreted. These time slices do contain preliminary indications of subsurface structures being present. They will require more processing before we have a clearer idea of what lies beneath the current floor. Additional plots are being processed and interpreted by GPR Slice and we should have some more conclusive data over the next few days. Hello. 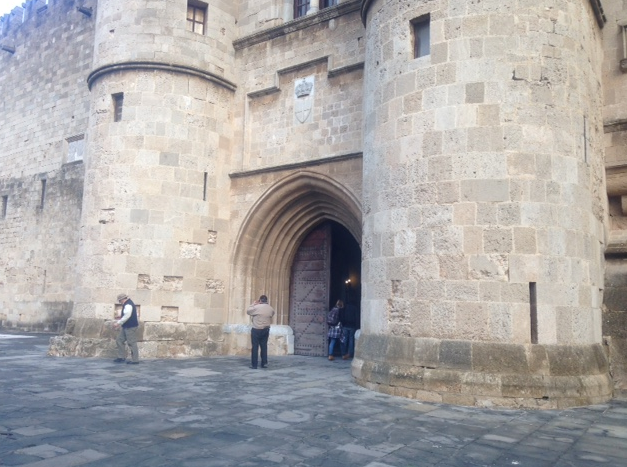 We made it to Rhodes, Greece on Monday January 12th without incident. 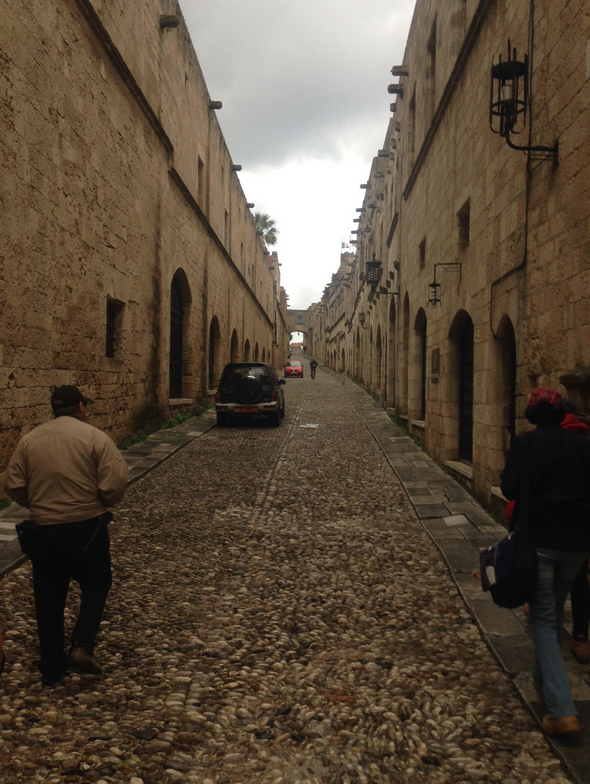 We are staying in what is called New Rhodes, as opposed to the Old City of Rhodes. The old city is a Knights Templar Fortress that was occupied from 1309 to 1522. The old city consists of narrow winding streets with many of the buildings now homes or businesses. Below are typical street scenes in the old city. There are four projects that we are working on in Rhodes. On Tuesday January 13th we started work at the Kahal Shalom Synagogue. First built in 1577, it is the oldest synagogue in Europe. It was destroyed, like many of the historic buildings in Rhodes by allied bombing in World War II. It was rebuilt in 2004 and now serves as a museum. There is no Jewish population remaining in Rhodes. They were rounded up by the Nazis in 1941 and all murdered at the Auschwitz concentration camp. We are working in Kahal Shalom to test the hypothesis that the 1577 synagogue was built on top of a yet older synagogue. Using ground penetrating radar we are looking through the contemporary floor for evidence of ruined buildings under the floor. We set up our work grid on Tuesday January 13 and began to collect data today (January 14th). We selected to complete work at this site first because of the horrible weather we have been having. Torrential rain and wind since our arrival. The weather is just starting to clear and we are hoping for a good enough day to work outside tomorrow. Below is a plan of the synagogue. We are working in the lower center area of the plan. GPR lines were laid out along the lower area of the plan in hopes of finding an indication of a ruined structure beneath the contemporary floor. It is further hoped that that data indicates structures oriented in a different direction the the reconstructed synagogue. Preliminary results from the data collected today seem very promising. 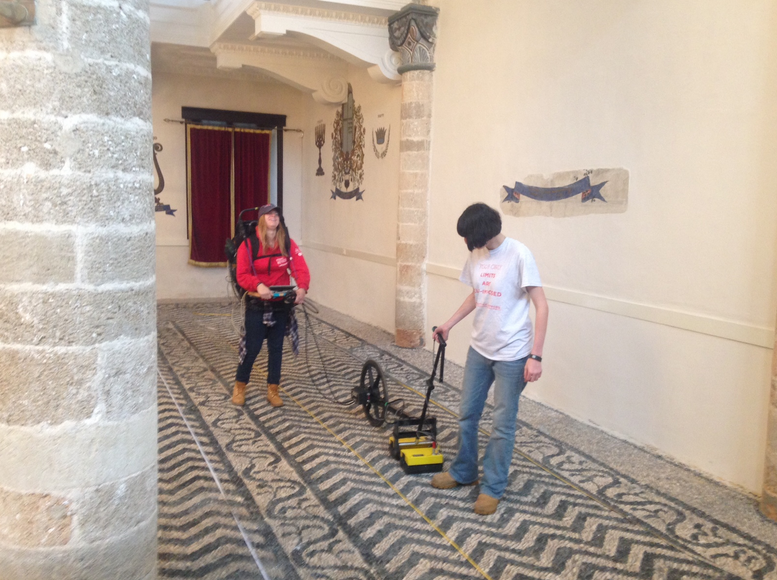 Below Emily and Nichole, both students from the University of Hartford, and who are serving as field assistants for this project, are collecting GPR data in the synagogue. We will finishing collecting data at this site later this week, and will move on tomorrow to work at what is called locally the Ottoman School. More details about that tomorrow. Sunday January 11 was our last full day in Israel and hence our last work day. The day was spent at Bethsaida doing GPR on the line we laid out on January 10th, and ERT in the area of a postulated escape tunnel from the main ruined palace in the city. The ruler of Bethsaida in the iron age would have used this tunnel to escape the palace if the city were under siege. Depicted below is an aerial image taken from a drone several years ago, depicting the location of the tunnel. The ERT line was placed perpendicular to the arrow to determine if the remains of such a tunnel, which would have allowed escape through both in inner and outer defensive wall of the city, are buried in the rubble. We finished at Bethsaida around 4 PM. and returned to the Kibbutz to prepare for the big event at 8:05 PM. What was the event? The Packers versus the Cowboys that was being broadcast live on the Middle Eastern Television network. Being a Packers fan I was overjoyed with the victory. At 1 AM we packed up the vehicles for the two hour ride to the airport. Our flight to Atens Greece left at 6 AM. We are now in the Athens Airport waiting for out 1:20 PM flight to Rhodes to begin phase two of the research. Rhodes is about an hour long flight. Tonight we are scheduled to have dinner with our collaborators from the University of the Aegean in Rhodes and local government officials. On Tuesday we are scheduled to visit all four sites where we will be conducting research, to get the “lay of the land” so to speak. Wednesday will be our first full field day. More later once we arrive in Rhodes.